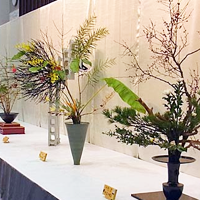 To introduce as many people as possible to the beauty of Ikenobo ikebana, Ikenobo Headquarters sponsors large annual exhibitions in major cities throughout Japan, and occasional exhibitions abroad. Please join us! Currently scheduled Headquarters-sponsored events are listed below. Please use the e-mail link at bottom to inquire about further details. Flower Offering Ceremony: 17th Feb. / Exhibition: 15th to 18th Feb.
26th Mar. to 1st Apr. Flower Offering Ceremony: 4th Apr. / Exhibition: 3rd to 4th Apr. Ikenobo Exhibition: 5th to 10th Jun. / Judged Competition: 9th Jun. The list below includes selected events for which the Ikenobo Headquarters will send a Headquarters professor. 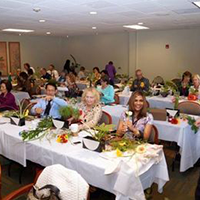 We hope you will join us to enjoy Ikenobo ikebana. We ask your understanding that participation in some events is limited by space, and that some events are limited to Ikenobo members only. For detailed information, and events not yet listed, please feel free to check on chapter contact information. 30th Jan. to 2nd Feb. The Headmaster, Ikenobo Professors Mr. Yukei Miura, Mr. Katsuhito Kurata, Mrs. Hekiha Kato and Ikenobo members from Japan will join the Ikenobo members in Shanghai to celebrate the 10th Anniversary. Exhibition and Headmaster Demonstration will be held during the period of time. Exhibition: 7th to 9th Jun. / Demonstration: 8th Jun. The Headmaster, Ikenobo Professors Mr. Takashi Moribe will join the Ikenobo members in Bangkok to display ikebana arrangements, celebrating the 30th Anniversary. 28th Sep. to 4th Oct.